Australian football was a product of a series of inventions, each being tied to a set of rules, which fleshed out the game's character. However, the implementation of rules often threw up new issues and problems, which necessitated further refinement and even the creation of new ones. The decades from 1858 to 1879 were an intense period of rule-making in Australian football, when a unique game of football took shape. 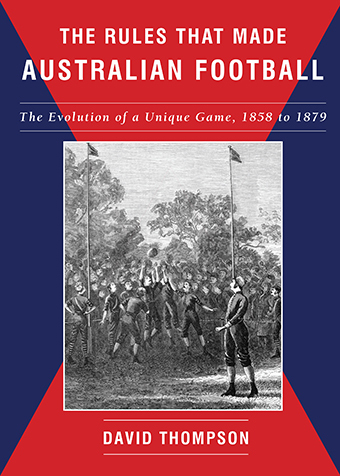 While there have been many publications on the origins of Australian football in this formative period this is the first work to focus primarily on the evolution of the rules that made Australian football so distinctive. Historians have been too quick to dismiss marngrook as a possible influence on the emerging code of Australian football. It would be surprising if some of the founders — consciously or even sub-consciously — were not influenced by some of the practices of Indigenous football. David Thompson is a teacher who lived by the Plenty River in northern Melbourne. His first book marks the convergence of some of his key passions: Australian and local history — particularly that of the 19th century and colonial times — and Australian football.